Varsity: Sophomores with 1+ years of HS debate and ALL Juniors/Seniors. The collegiate APDA style with the 7-8-8-8-4-5 format will be followed. One or more straight-link motions will be released per round, and debaters will have 15 minutes before the start of debate to prepare cases. 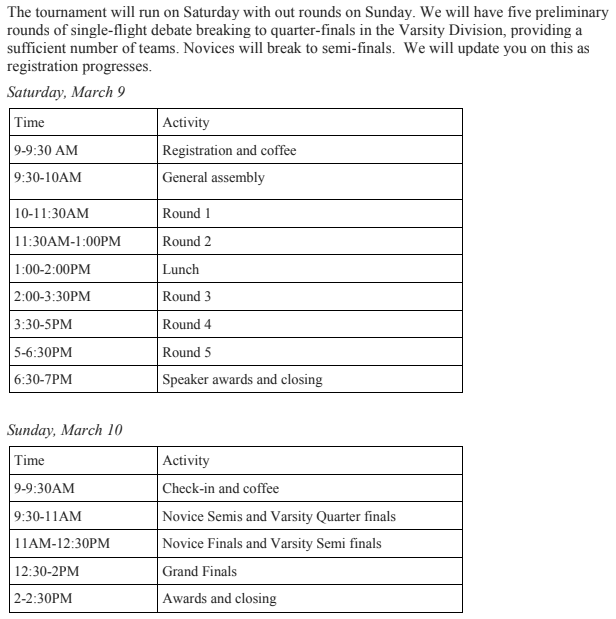 Some rounds teams may be assigned sides, others, motion and side will be determined by a coin toss. Debaters are not permitted to use briefs, prepared cases, research material or the internet during their preparation period or during the debate. They may use laptop or tablet computers to take notes during preparation of the round, or to speak from the podium, but they may not use research material stored on said devices. They may use electronic devices to keep time. This does not mean that debaters cannot cite facts or references during the debate, only (following APDA guidelines) that these facts be generally well known or fully explained in the speech to both the other team and the judge so they can be critically evaluated. The registration, participation and judging fee is $145. The exact cost for the overnight accommodations and transportation will depend on how many kids attend. We will split all costs once we return. If you are willing and we need you to judge, you can have a portion of this fee waived by volunteering to judge. See below for details. JUDGING: WE NEED JUDGES! We are required to provide trained judges for Saturday. Judges will be able to return home on Saturday evening even if we break. They are providing collegiate debaters as judges for all out rounds. The number of judges we need depends on the number of competitors we bring. This is the way these competitions work: If we do not provide judges, our kids cannot compete. Judging is a very big time commitment. We leave early and return late. Judges are "on" for a big part of the day. Judges also have to be prepared and willing to be trained before judging. Having said this, judging is very fun. Although it might seem intimidating the first time, people always want to do it again. In order to be as fair as possible, we distribute the judging responsibility among all those competing. Each of our competitors will be assessed a $45 judging fee for the tournament. If that competitor provides a judge, and we use that judge, the judging fee as well as the participation fee will be reimbursed - those fees are paid for by the judging fees of the other competitors who are not providing a judge. This distributes the judging responsibility among all the debaters and ensures that everyone who wants to can compete regardless of finances. If we are short judges, we try to find non-competitor parents, or friends or neighbors to judge and offer them the fees for their services. We must provide trained judges, and to prepare them, Mrs. Henderson will provide materials and meet or talk to our judges prior to the competition. If we have more judges sign up than we need, fear not, there are many upcoming competitions so you will definitely get a chance! If you have indicated you would like to judge, we will let you know if we need you within a few days after the completion of registration. We will be meeting at Mrs. H.’s at 6:30 AM. Please have your child come dressed in their business attire on Saturday morning as they will be going straight to the tournament. The weather will be chilly so remember they will be outside walking in and out of buildings and to the hotel - dress accordingly. Please pack lightly as the van will be full. Please pack food/snacks for your kids, and students with special dietary needs should definitely bring their own food. Most schools do not have restaurants nearby and the time for lunch is short, so students and judges should not expect to have time to go elsewhere for lunch. 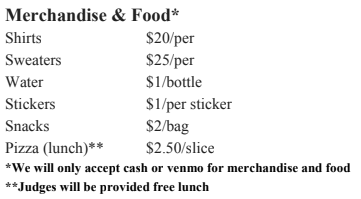 Some schools sell candy or baked goods (see below) during the tournament, but students may want to bring snacks for between rounds. They will also need money for lunch and dinner on Saturday and breakfast and lunch on Sunday. Debaters will want to carry a water bottle to prevent dry mouth during the rounds. Students should have highlighters, paper and writing instruments to flow.